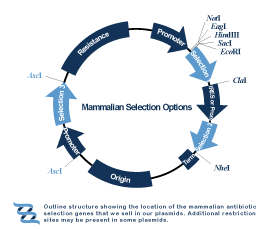 Please select the organism group below to find out more about the antibiotic selection options for these organisms. 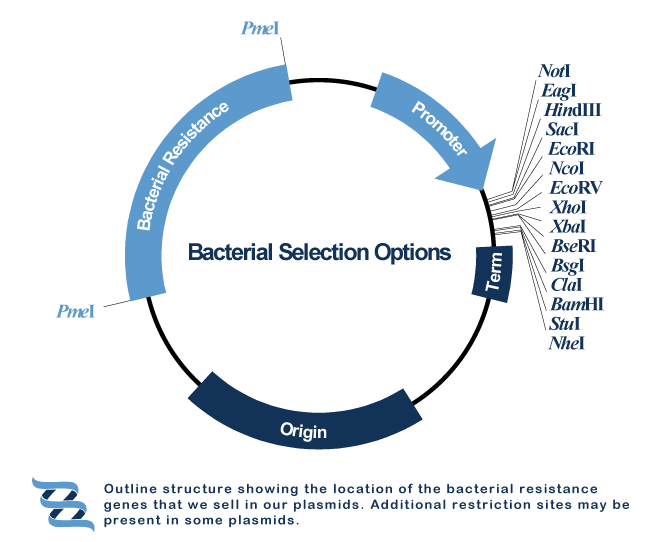 Cloning: Our bacterial selection markers are normally flanked by two PmeI restriction sites. They will function if they are inserted in either orientation between these two sites. For the correct concentrations of each antibiotic to use in either media or agar plates see our protocol page. Under the direct control of the CMV promoter in the main MCS. Under control of the PGK promoter immediately after the main multiple cloning site. Th e poly-adenylation signal is the same as that used by the upstream CMV promoter. Under the control of an internal ribosome entry site (EMCV or FMDV). These can often demonstrate low, or variable activity depending on the sequence, cell line and sequence of the upstream gene. Yields of 1-5% of the upstream are not uncommon. Under the control of either the Rous Sarcoma Virus (RSV) promoter (low expression) or the Human Ubiquitin (Ub) promoter (high expression), where the entire expression cassette is inserted away from the main multiple cloning site in the other half of our vector, flanked by two AscI restriction sites. Please browse our resistance constructs using the buttons below. All of our constructs are designed for broad compatibility and versatile cloning, allowing you easily to produce any derivatives you require. As ever, if you prefer to outsource the cloning work, we are happy to undertake it rapidly and efficiently. Please use the 'Request Quote' button below to evaluate possible modifications to your chosen plasmids.